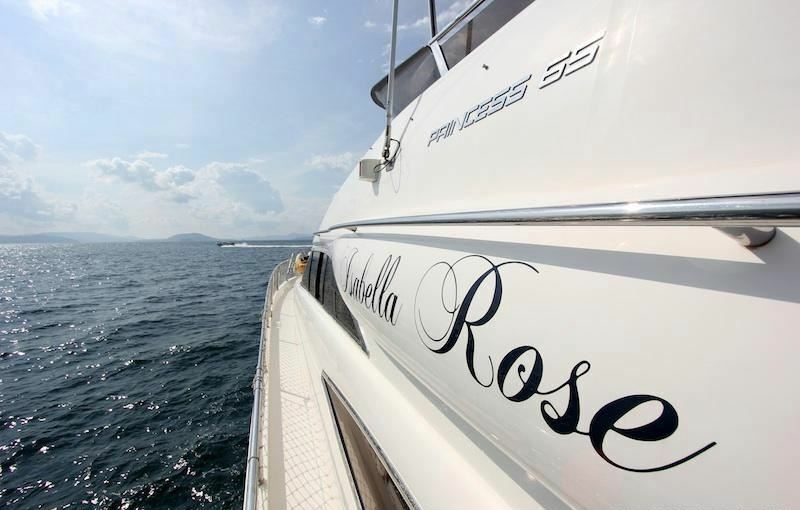 Motor Yacht ISABELLA ROSE is a Princess 65 motor yacht measuring 20.9m. 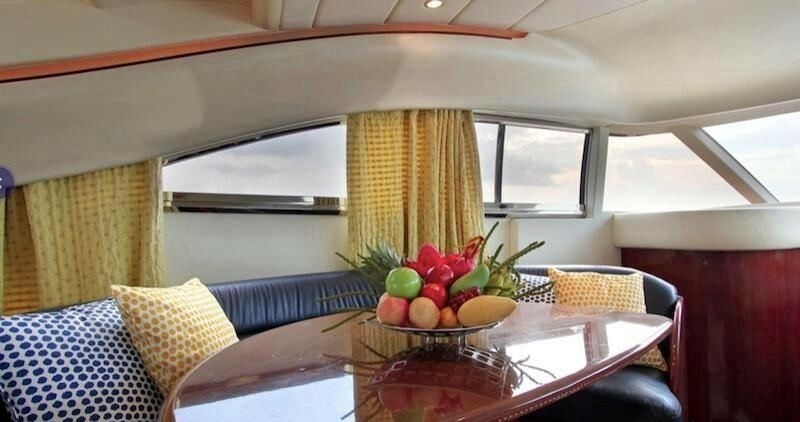 The yacht was built in 2000 and refitted in 2011. 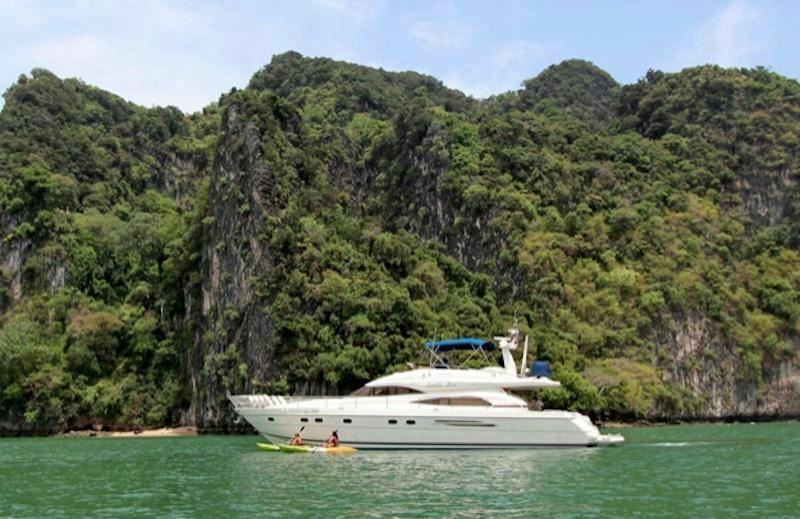 Yacht ISABELLA ROSE is based Phuket, Thailand and is available for private charters in all the major cruising areas around the Andaman Sea and South East Asia. 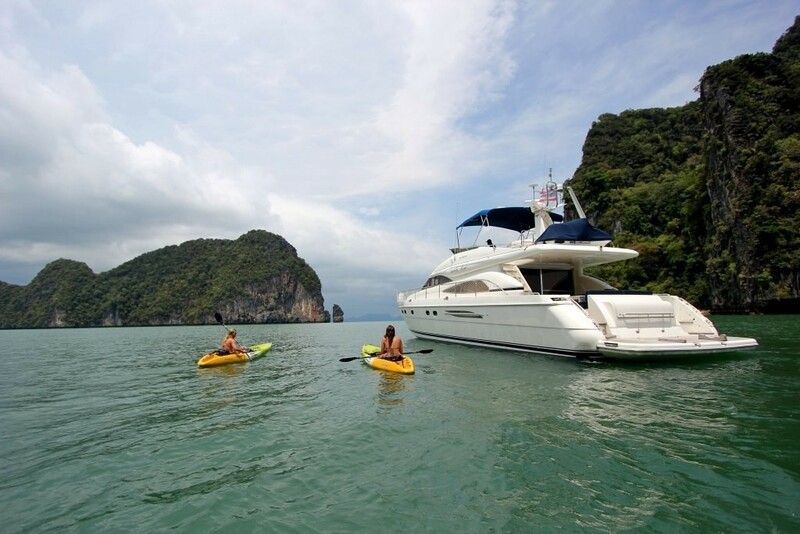 The ISABELLA ROSE motor yacht is ideally suited to chartering in the waters around Phuket with large outdoor areas ideal for relaxing and sunbathing, as well as substantial covered and indoor entertaining areas. 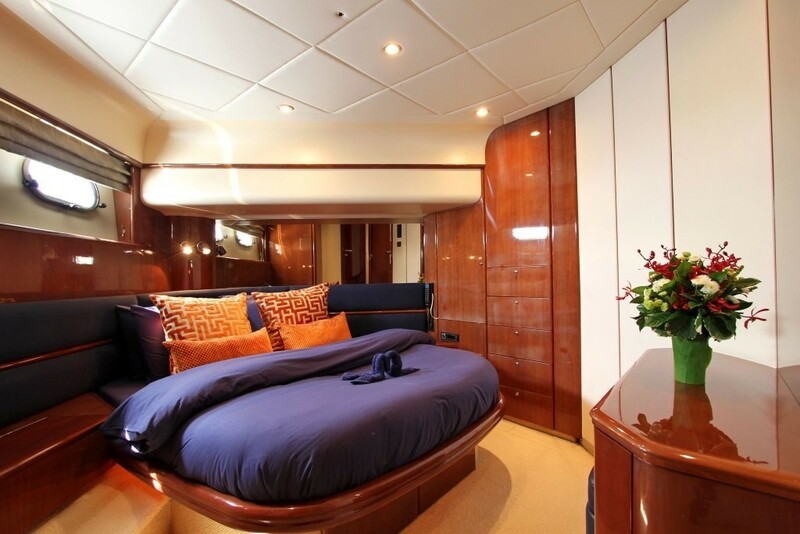 M/Y ISABELLA ROSE features a spacious and finely appointed interior, upholstered in blue leather and light neutral tones, glossy woodwork and wraparound windows. The open galley enables guests to check in on the chef’s gourmet creations. 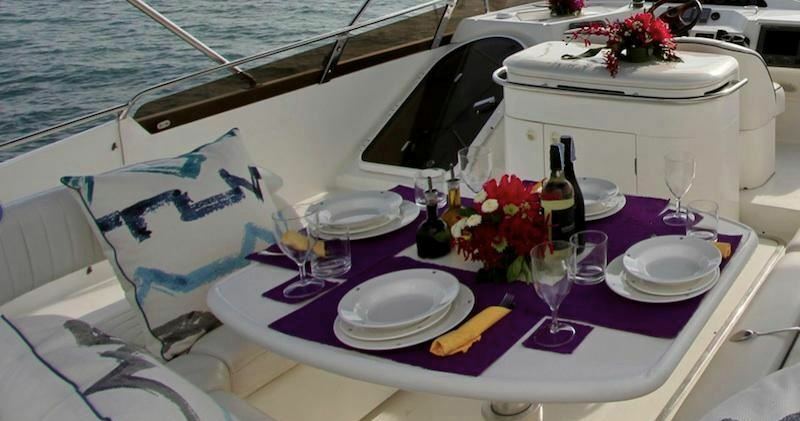 Further forward and to port is a dining table seating up to 8 guests. 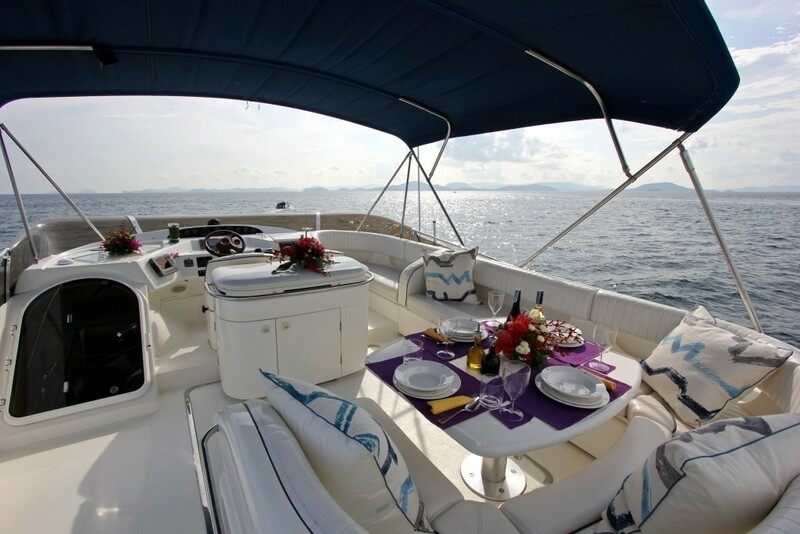 The yacht is fully air-conditioned and the saloon area has a full entertainment system. 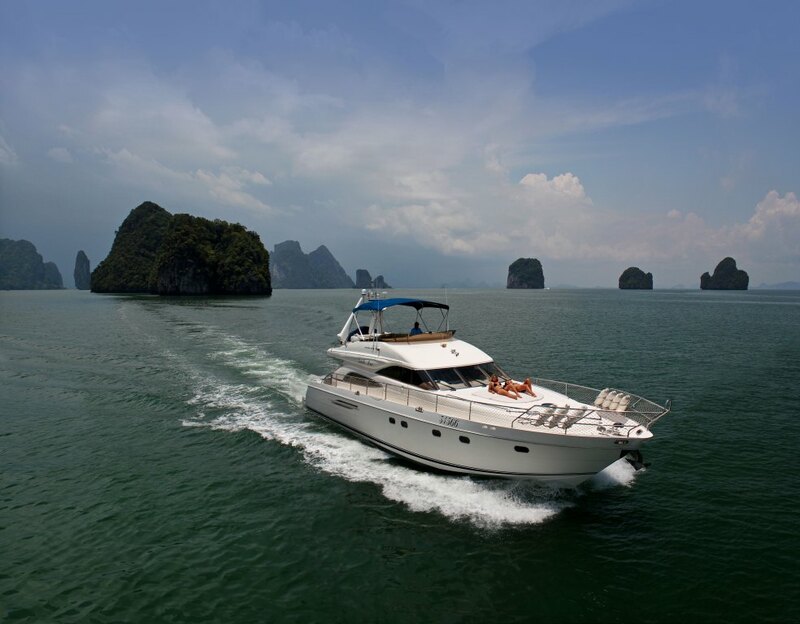 Thailand charter yacht ISABELLA ROSE features flybridge design which offers guests plenty of outdoor living space to enjoy the tropical sun. 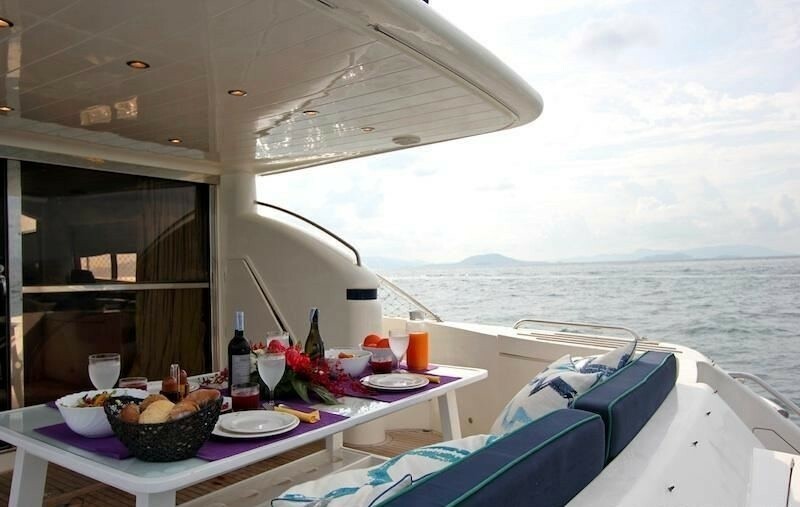 Al fresco Dining is offered on the aft deck, that has a hard top roof of the fly bridge for protection, and dining is also offered on the fly bridge deck, covered by a Bimini top. 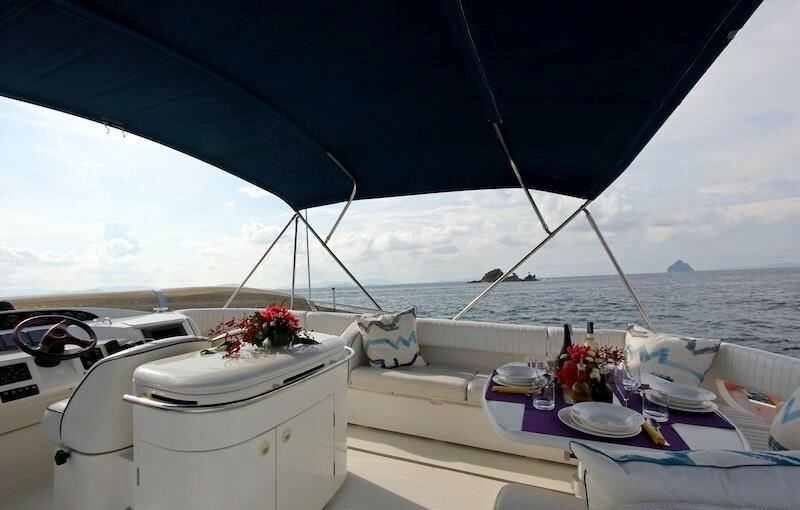 Enjoy sunbathing and stargazing on her large, forward sunbed…or take a front seat for the excitement of cruising at high speed to your next destination. 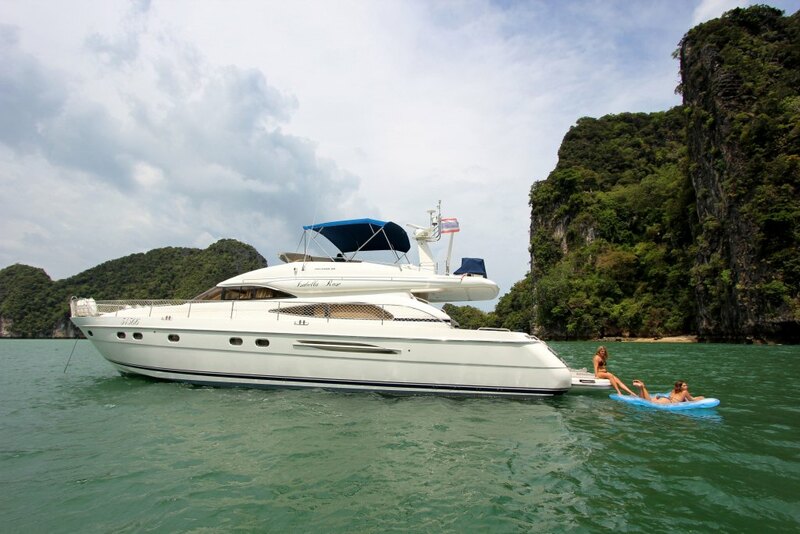 The Princess 65 yacht ISABELLA ROSE also boasts a large swim platform for where you can enjoy the water sport toys or diving into the refreshing sea water. 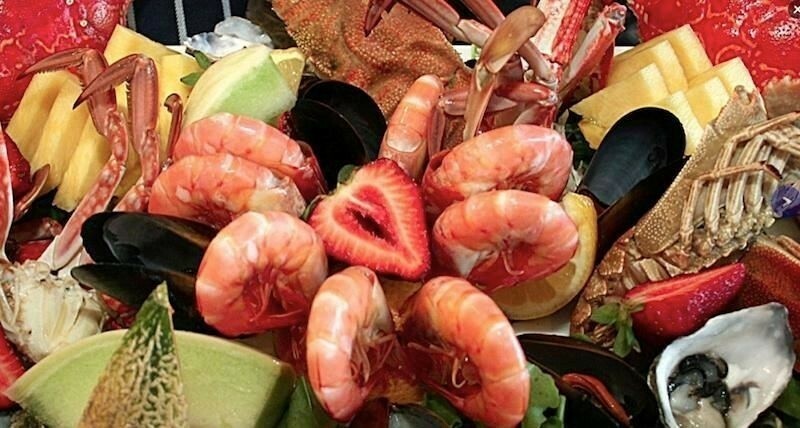 Professional skipper, Cook and deck hand. Full board gourmet food accommodation with free beer, 6 cans per adult, water, tea, coffee. Fuel for 3 engine hours a day and tenders. Use of on board equipment, such as sea canoe, snorkeling, and fishing rods. All National and Marine Park Fees. Fuel additional charge, if applicable, 250 Euro per hour. 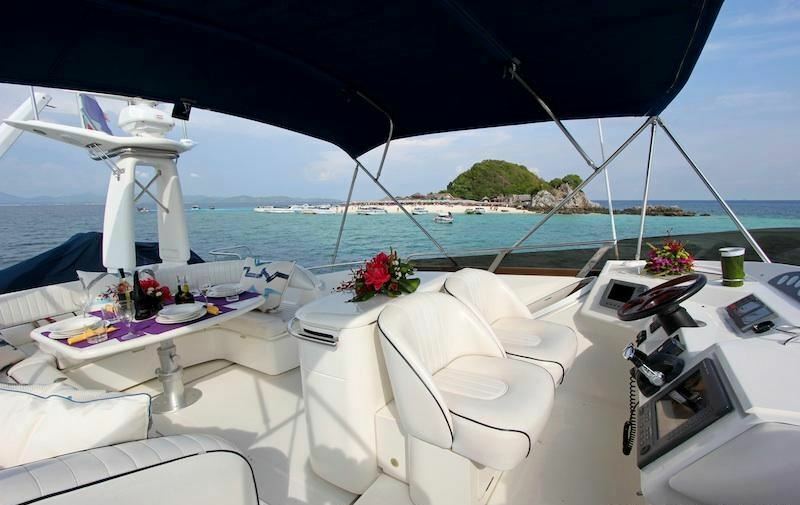 Surcharge for Similan Island 1,000 Euros. 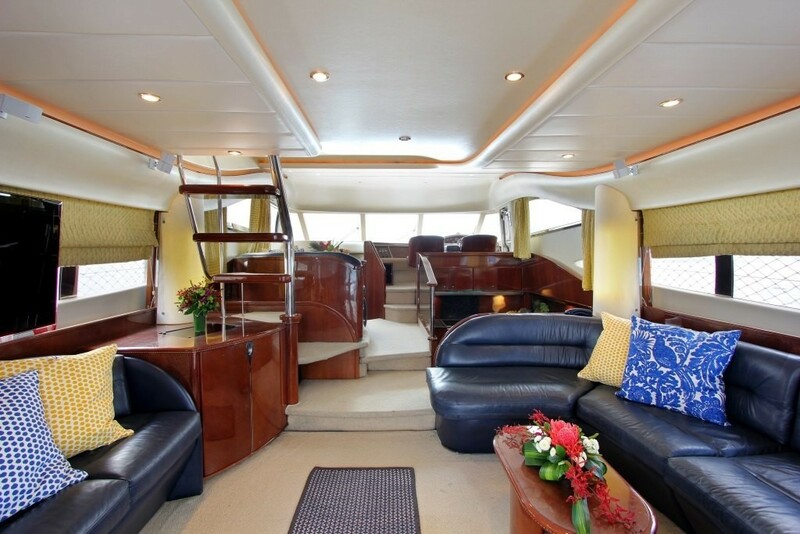 M/Y ISABELLA ROSE is able to accommodate 9 guests in 4 cabins. 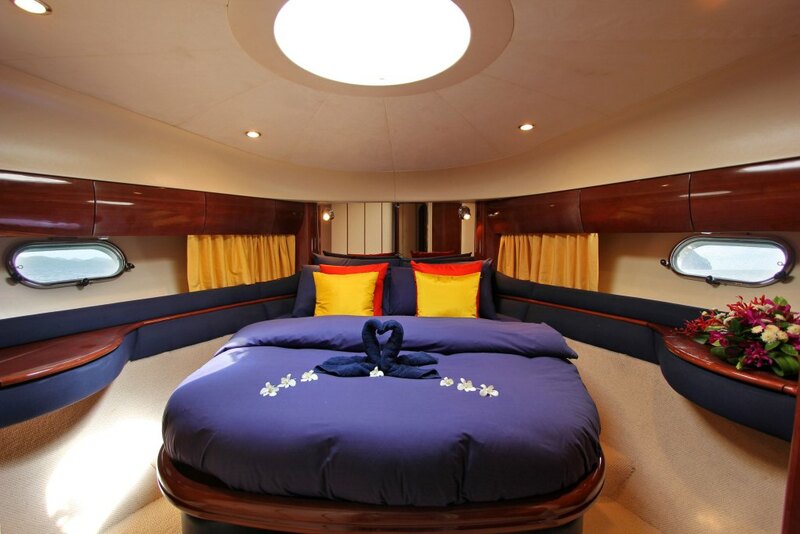 The Master cabin has a double bed, shower and toilet. There is a double bedded cabin with shower and toilet. 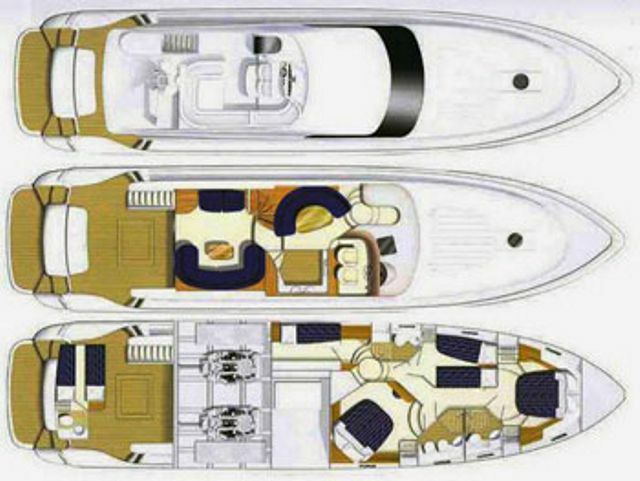 A twin cabin with pullman, shower and toilet and a childs cabin with a single and 1 pullman bed. ISABELLA ROSE is fully air conditioned throughout. Her Crew of 3 have separate heads and shower.